If individually we are children of God and collectively we are the body of Christ, why do we gather on Sunday mornings, Wednesday nights, or any other time in the week for “church”? What is the purpose of our gathering? If we go to Acts 2:42, we get a really cool picture of what the “first church” looked like through these four activities. Devoted to the Apostle’s Teachings – Keep in mind, there really wasn’t a “Bible” yet so when the early church gathered, what they heard shared was the teachings from the disciples; stories from when they walked with Christ and words of encouragement and teaching from the apostles themselves. To fellowship – Yes, they used that word back then too!! In this case, it is more literally referring to “community” or “joint participation” not so much coffee hour, donuts and time with friends (although that can be a delicious part of it!). To the breaking of bread – It is generally believed that the breaking of bread here refers to communion, which interestingly is the same word as the one used for fellowship above. It’s the idea of the body of Christ being one, participating in one holy communion and united by one Holy Spirit. To prayer – The people of the early church gathered to talk to God and listen to God together. That was part of what “church” looked like for them as they came together as the body of Christ. Lots of similarities to today. But then, a lot of differences too. For instance, there is a strong emphasis on “together.” Community, communion, fellowship – no matter how you break down these words, it was about the whole body of Christ in “joint participation” together. It wasn’t about a person coming and being fed or another person coming and have a great experience in worship. There’s no emphasis on the individual at all. The emphasis is the body of Christ. Sometimes though, when we come to church that does not seem to be our emphasis. I hear a lot about individual preferences, personal needs, and unique desires expressed regarding reasons for attending church. And as a family minister, I hear a lot of these things expressed specifically when we talk about including children in the corporate worship service. Because kids will distract from those things. They will by the very nature of their budding personalities and growing maturity keep us from being able to get those things out of church. Kids are distracting but they are not a distraction. Let’s be clear on this; children are not a distraction. They might be distracting. No wait, they are distracting. But they are not a distraction. They are members of the body of Christ. They are part of the community of faith. They are in fellowship with the church of God. And they are the only group of people Jesus specifically instructed us to welcome. I get that they can be distracting when they keep us from getting what we want out of church. But is that what church is supposed to be about? Or is church supposed to be a place where we come, together, to learn the apostle’s teachings, fellowship, break bread and pray? As I’ve watched kids in church, I’ve seen two things. I have seen children lead the call to worship, lead the congregation in song, kneel and pray at the altar, and affirm their faith with the whole church. I’ve also seen them drawing pictures on random bulletin inserts, turning around to see what others were doing, fidgeting and squirming, and, well, being distracting. The tradeoff seems worth it to me. They are members of Christ’s body. The body of Christ is built up by them. 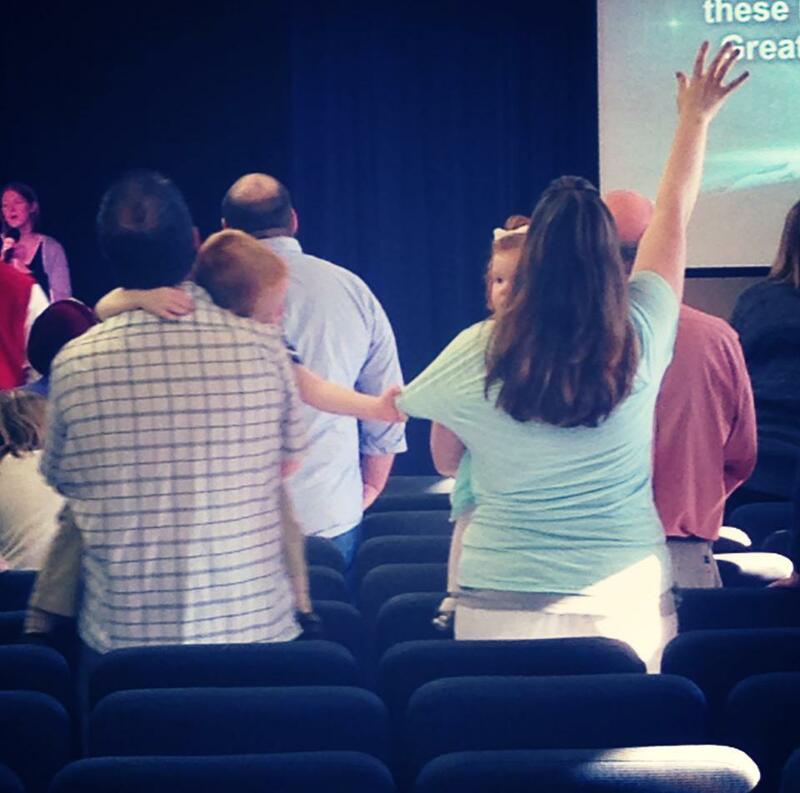 If church is about US and not “me”, then most certainly, there must be times when WE are all together. Kids don’t come expecting to get anything but they come ready to give. Every chance they have to actively participate, they will. Not reluctantly or under coercion; if they have are given a chance to be involved, they excitedly do just that. I think we need to give them more chances. Does that mean we will need to seek other times to grow personally without that distraction? Yes, it does. It also means as a community we should provide those times for one another. I cannot emphasize the importance of this enough – it is an absolutely imperative part of communion that we seek to serve one another, not just a few volunteers each week, but the the entire body of Christ. Focusing on one, while neglecting the other, is not church. Church is Christ’s body. Church is communion. Church is joint participation. Church is US. Who am I? I am a child of God. Why are we here? We are here to know more of God and His covenant of love to US. Another great blog post – thank you for sharing your thoughts. Its difficult in a consumer society that makes everything about “me” to sit back and reflect on community/fellowship is. I hope you have a blessed Easter! Thanks so much! I hope your Easter is blessed as well. He is Risen!